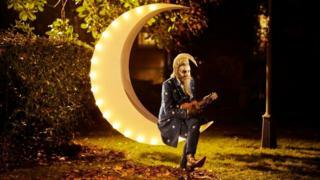 Image caption Alan Moore, in a still from his movie The Show, said film was a way of presenting youngsters with an alternative to a "bleak relentless message of futility"
Comic book writer Alan Moore says a new film festival is "inspiring the next generation" by giving them a "voice". Northampton Film Festival was set up to reach "disenfranchised" young people and it is being backed by The Watchmen/From Hell author, who is from the town. "The fact I could express myself creatively was the thing that saved me from certain doom," said Moore. "To offer that to these young people - it can't be valued enough." Becky Adams, director of organisers Screen Northants, said finding new audiences had been "hard" but worth it. "We hear a lot from young people who think doors have closed," she said. "The joy of film is that everyone is out of their comfort zone. "When you're in that position, your confidence improves." Ellen Page, 17, signed up as a volunteer after "struggling" with social anxiety, to the extent she had to sit her exams in a smaller room as big groups of people "overwhelmed" her. She helped to shape the new festival's programme alongside industry experts twice her age. "I had to make the choice to speak. It was amazing," she said. "I've regained a lot of my confidence." Moore, who recently filmed his first movie The Show in Northampton, spent five hours watching competition entries as a festival judge and said he was "incredibly impressed". "We rely upon the energy of this next generation. [Not] giving them a bleak relentless message of futility is as important as anything I can think of," he said. Kate Dow, 24, is showing a film she made about feeling "alienated" while growing up. "I wanted to make something that showed my discomfort," she said. "It was cathartic putting that together… I don't feel like that anymore."